Fights between members of Ukraine’s opposition and the police broke out in Kiev, as several hundred people protested against a bill on minority languages. Tear gas was used, although it's not clear by which side, and several people were injured. ­Only 72 hours ago, Kiev was the venue for a truly remarkable battle – the Euro 2012 football championships’ final match between Spain and Italy. On Wednesday, a spot in the Ukrainian capital – literally meters from where the fans had partied for three weeks in a special fanzone – turned into a battlefield of a different kind – scuffles with the police, sitting hunger strikes, tear gas and speeding ambulances. People who now call themselves “protectors of the state language” surrounded the so-called Ukrainian House – formerly a museum of Lenin, now an exhibition center displaying feats of Ukraine’s culture. Their decision to picket this particular spot was not only driven by symbolism – but it was due to become the venue for President Yanukovich’s annual press conference, which was later cancelled. That’s why when a decision to remove the crowd from the entrance was made, a large-scale brawl broke out between activists and riot police. It is still unclear who sprayed tear gas in the crowd – the police or the right-wing radicals, but several people received facial and lung injuries and had to receive medical help. Among them was one of Ukraine’s sports icons – heavyweight boxing champion Vitaliy Klitschko, who is now pursuing a political career and stands a good chance of winning some seats in the future parliament. Several deputies of Yulia Tymoshenko’s bloc and the Our Ukraine party said they would go on a hunger strike until the bill is curtailed. 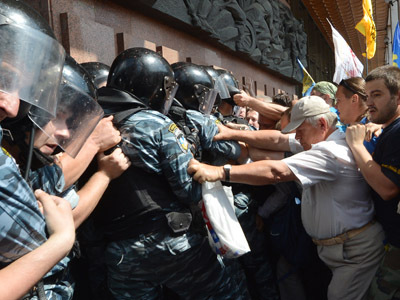 ­Kiev is no stranger to protests – political life in the country has been like a rollercoaster ride ever since early 2000s. In fact, even the Euro 2012 fanzone was neighboring the ever-present tent camp of the opposition, which for almost a year now has been protesting against former prime minister Yulia Tymoshenko’s imprisonment. But this time the opposition deputies – and those activists sharing their beliefs – made it clear that to them it was a matter of national, cultural and ethnic integrity. The core of the problem has been the controversial “languages bill”, which by its design is meant to grant broad regional rights to several languages, spoken by ethnic minorities across Ukraine. The list includes Russian, Hungarian, Romanian, Tatar and several other languages. If this bill is ever to become law, this would mean that ethnic minorities in Ukraine would be able to study their mother tongue languages in schools, watch movies dubbed into their language, and use the languages for documentation in regional bodies of authority. It was eventually proposed by the ruling party’s deputies Kolesnichenko and Kivalov, but in fact it has been more than a decade in the making. ­It was originally conceived by a member of the Hungarian diaspora in the West of Ukraine Mikhail Toft, who was worried that his minority was deprived of any possibility to speak their mother tongue. The idea was later developed by one of the most respected political figures of the 1990s in Ukraine – Evgeniy Kushnarev. 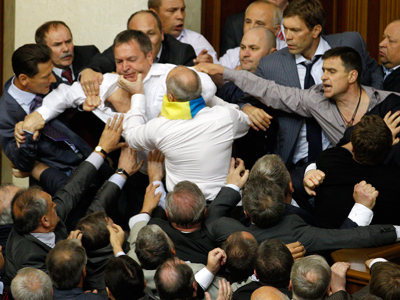 Only in 2012 did the bill become a reality, but it has caused outrage among some parts of Ukrainian society. Despite that it never said the country may have several state languages – with Ukrainian remaining the only official state language – and despite it being based on the European charter of minority languages – one of the conditions under which a country could become an EU member (something so strongly desired by both the ruling party and the opposition) – deputies from several political forces within parliament turned it into a matter of life and death for the Ukrainian language and culture as a whole. 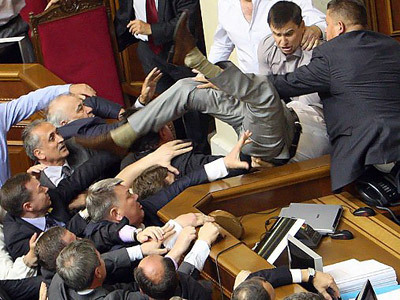 ­Deliberations on this bill led to one of the biggest fights inside the walls of Ukraine’s parliament in several years. On Tuesday it was passed in a 2nd reading, also sparking a massive brawl between the deputies. Then it went into the streets. “By sending the police out to fight us, not only the body of a Ukrainian is being stamped on, but his soul as well,” said Oleg Tyagnibok, leader of Ukraine’s nationalist movement “Svoboda”, the driving force of this protest. But the person behind this bill – deputy Vadim Kolesnichenko – firmly believes this is their way of attracting the electorate ahead of this fall’s parliamentary vote – by spreading false propaganda. “As a person born in a Russian-speaking family, I would certainly have been happy to see the Russian installed as Ukraine’s second state language," Kolesnichenko told RT. "But we all understand this is NOT possible in Ukraine. That’s why we created this bill without a condition of changing the constitutional status of Ukraine’s language as the only state language. This bill is meant to respect the rights of minorities in our country, and everyone who stands against it either didn’t read it or uses his stance to gain political points”. ­The situation is getting more intense every minute. While around 200 men continue picketing central Kiev, the parliament’s speaker Litvin resigned – before making a contradictory statement he would never put his signature under this bill (this would mean the bill wouldn’t reach president Yanukovich for final approval). Ukraine’s president also came with a sensational statement of his own – saying unless this crisis is resolved, he won’t exclude the possibility of dispersing the parliament and holding an early ballot. 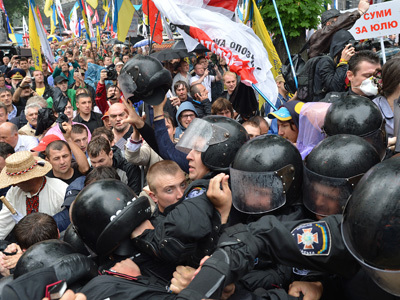 To add more fuel to the fire, a court in Kiev issued a ban on any protests in the centre of the capital, which would make any further protest illegal and, possibly, lead to more fights between the opposition and the riot police. And while the country hangs at an abyss of yet another political crisis, the final word still belongs to Yanukovich – now only he can say “yes” or “no” to the bill. And experts agree – it may well be a lose-lose situation in both cases.